Not learning from my previous experience in Loch Lomond (link), I hadn’t booked a table. I had tried to book a table at CAMRA recommended pub which is a little off the beaten track, but no one got back to me and when we decided to just turn up instead they appeared to be renovating the place (this didn’t really tie up with their social media posts of events that were happening that week?!). Thankfully, we were lucky on this occasion and turning up just as they opened for the evening worked in our favour. We could only have the table for an hour, but as long as we were fed I didn’t care. As with many pubs and restaurants in Scotland there is a grand variety of whiskeys on offer. 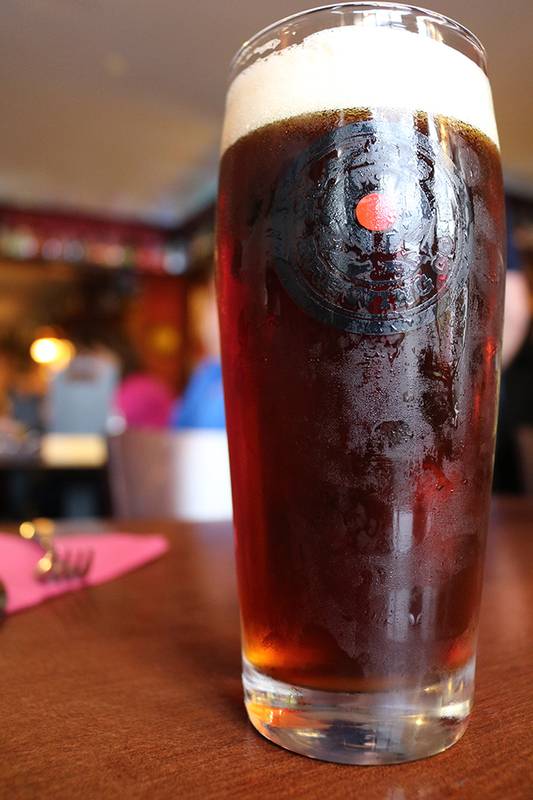 Sadly, I’m not a whiskey lover so I turned my attention to the local ales. Both D and I opted for the Black Isle Red Kite Scotch Ale, an organic amber ale at 4.2%. We decided to skip starters as there wasn’t any that took our fancy. D ordered the Scottish lamb cooked two ways and I ordered the Highlander chicken. 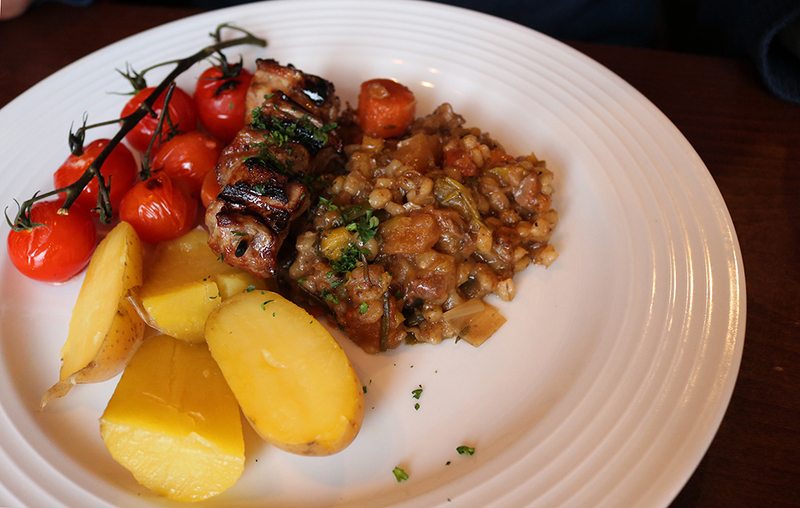 The lamb was a slow cooked shoulder with pearl barley, turnips, carrots and leek with the second piece of lamb being a chargrilled fillet and served with new potatoes. I had a couple of bites and it was delicious, D loved it too. The Highlander chicken consisted of chargrilled chicken with Cockburns of Dingwall Haggis served with mashed tatties, bashed carrots and neeps accompanied with a Dijon cream sauce. There was no way I was going to visit Scotland without having some haggis, plus I needed to prove to D that haggis could be delicious if served right, our previous visit toEdinburgh hadn’t convinced him at all. This was probably one of the best mains I had on our trip, everything went together perfectly. Everything was cooked to perfection. 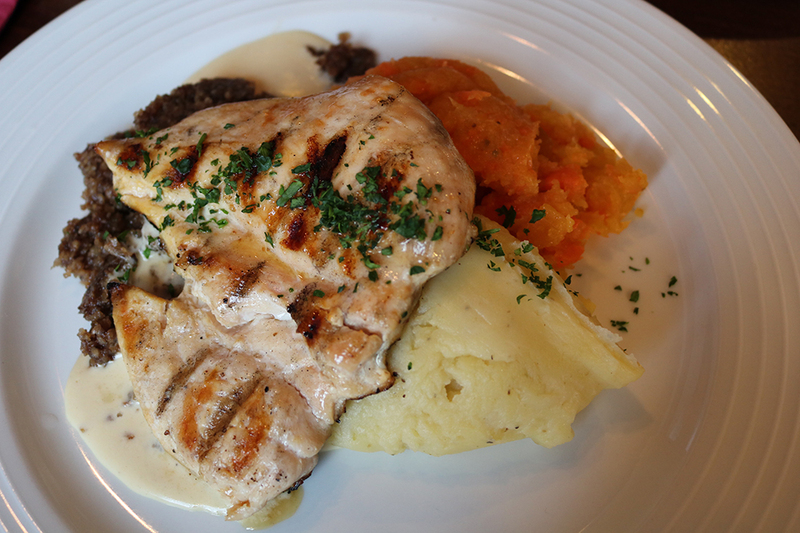 It is the perfect Scottish meal. Not something that I would have expected from a prime tourist spot restaurant. It’s sad but true that most restaurants that benefit from footfall don’t often put the effort in, especially in tourist destinations. We skipped dessert, again not really seeing anything we fancied on the menu, plus our time was running short and if I’m honest we were a little tired from traveling all day. If you fancy on giving them a whirl don’t forget to book a table during peak season! Watch out for Nessy! 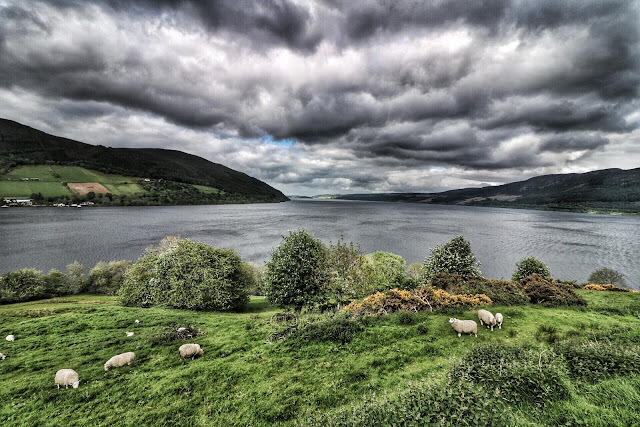 There are local tours that can be booked through tourist information (opposite the Fiddlers) for trips out on the Loch and there are even Nessy excursions for those who fancy trying their luck in trying to spot the little blighter. For those who are looking for more of a thrill than a steady boat ride, there are rubber dingy type boats that depart from both Drumndrochit and Fort Augustus that speed you around the loch. Hang on to your camera! 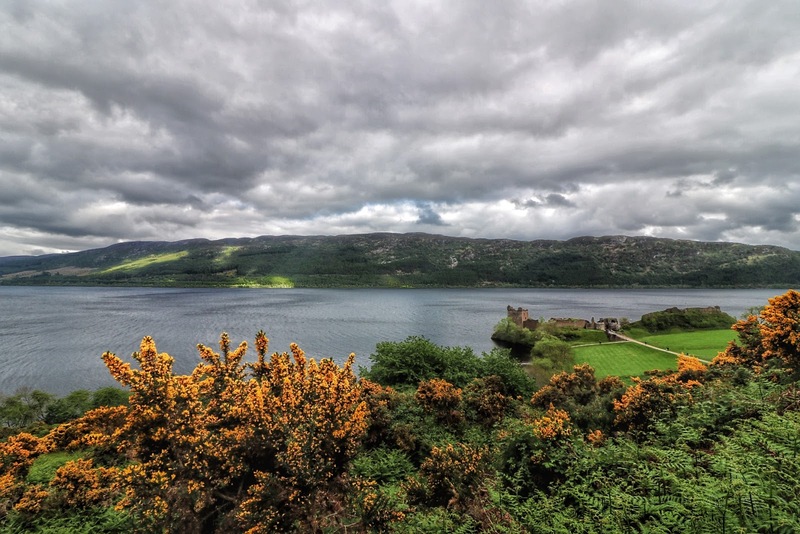 A ruin that dates back to the 13th Century creates a beautiful picture with Loch Ness in the backgourn. However, best to note that the car park is often full in high season. 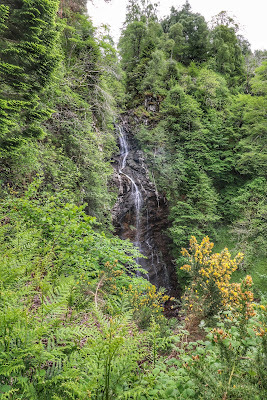 If you don’t fancying paying the £9(ish) price to walk around the ruins there are some good spots along the roadside to take pictures, just be careful where you park as lorries don’t come slowly down this main road to The Highlands. 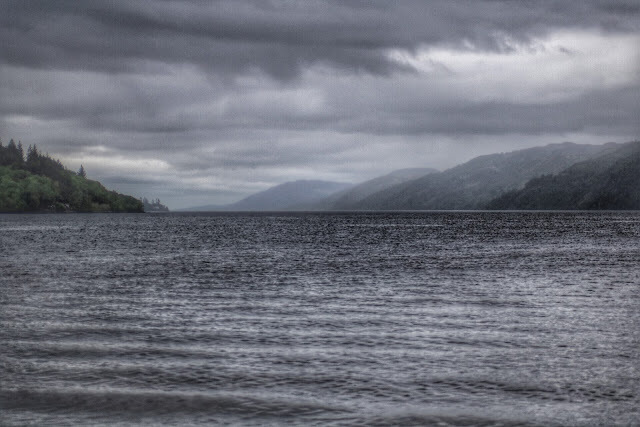 This was the main attraction in the Drumnadrochit in the Victorian era before Nessy raised its head. Even in high season this was a quiet walk, we saw no other person which was kind of romantic in its own way. There is a small amount of parking just off the road side and it’s only a short (but uneven) walk to the waterfall. 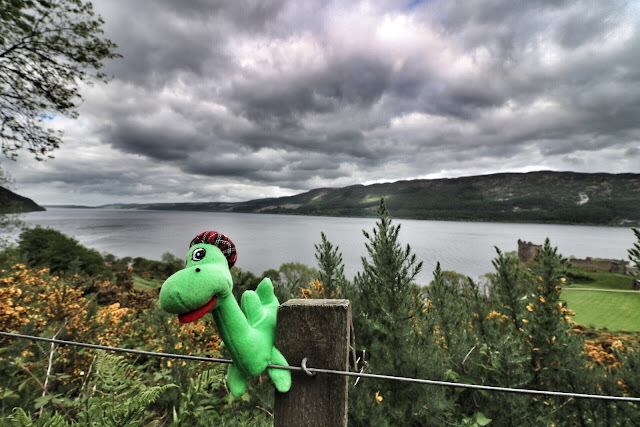 ..... and last of all, don't forget to keep an eye out for Nessy! !